Revolution's ability to produce bold and honest productions of Shakespeare's canon is generously supported by The Wyncote Foundation, the MKM Foundation, the Pennsylvania Council on the Arts, the Charlotte Cushman Foundation, and the Philadelphia Cultural Fund. We are fiscally sponsored by The Painted Bride Arts Center. Brewery ARS is our fundraiser sponsor. 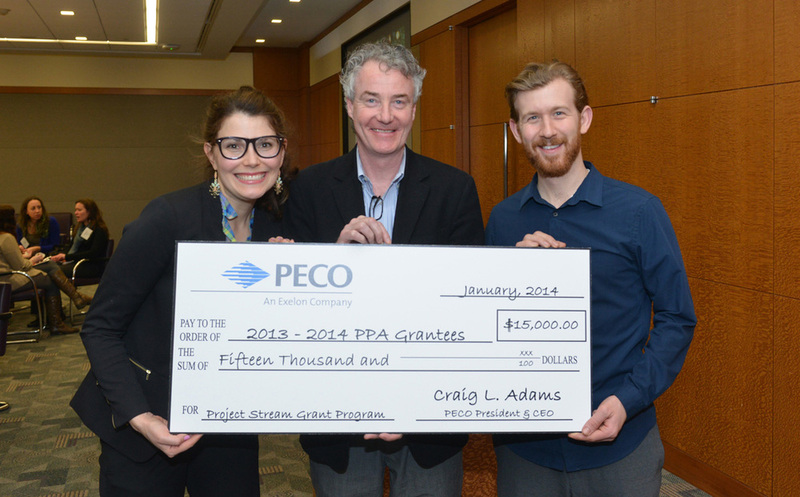 Education Director Jess DalCanton and Artistic Director Griffin Stanton-Ameisen pose with John McInerney, Vice President of Marketing & Communications of The Philadelphia Cultural Alliance at the 2014 PA Partners in the Arts Project Stream Check Ceremony.